France's nuclear safety watchdog has ordered a plant in the country's south to temporarily close after a uranium leak polluted the local water supply. The plant's operator has been told to improve safety procedures at the site. Waste containing unenriched uranium leaked into two rivers at the Tricastin plant at Bollene, 40km (25 miles) from the popular tourist city of Avignon. People in nearby towns have been warned not to drink any water or eat fish from the rivers since Monday's leak. Officials have also cautioned people not to swim in the rivers or use their water to irrigate crops. Approximately 30 cubic metres of liquid containing unenriched uranium spilled from an overflowing reservoir at the Tricastin facility, which handles liquids contaminated by uranium, into the ground and into the Gaffiere and Lauzon rivers. The site has a nuclear reactor as well as a radioactive treatment plant. The leak happened late on Monday night, but people in the affected areas were not informed until 1000 GMT on Tuesday. The French Nuclear Safety Authority (ASN) inspected the Tricastin plant on Thursday and found that existing prevention measures were deficient and that its operator, Societe Auxiliaire de Tricastin (Socatri), had been too slow to inform authorities about the leak. The ASN is to submit a report to the state prosecutor for possible legal action against Socatri. The company is a subsidiary of the French nuclear giant, Areva. The safety inspection found that "security steps aimed at preventing any further pollution were not completely satisfactory", the ASN said. The inspectors also found "irregularities" at the site's operations at the time of the leak. Socatri has been ordered to implement "a reinforced surveillance plan, including analysis of the surrounding rivers and ground water". French Ecology Minister Jean-Louis Borloo said on Thursday that there was "no imminent danger" to the local population. Socatri has said tests of the groundwater, local wells and the rivers show they have not been contaminated. One anti-nuclear organisation has said it will take legal action against ASN, saying it had delayed sounding the alarm. 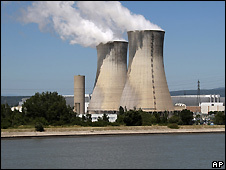 France is one of the world's most nuclear-dependent countries, with 80% of its electricity coming from nuclear power.